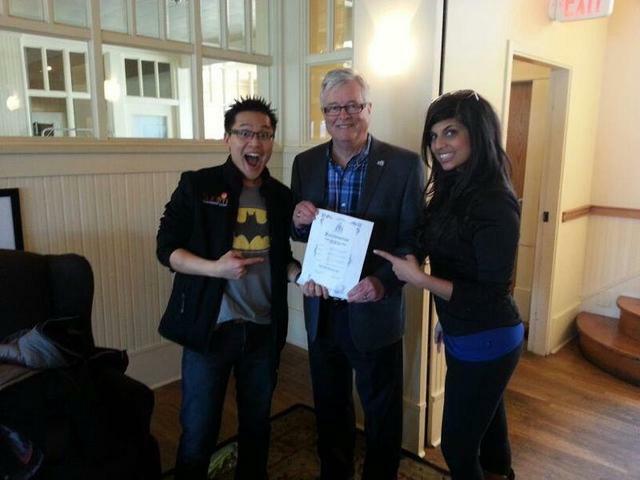 April 4 is ‘Talk Like Batman Day’ in Kelowna… officially! The internet loves to celebrate silly ideas. “Sandwich Day”, “Macaron Day”, “T alk Like a Pirate Day”…so why not start our own? Introducing “Talk Like Batman Day”! crime-fighters in a fun way, AND get Kelowna on the map by being the first city to declare an official “Talk Like Batman Day” on April 4th. Sounds like a solid plan to me. They managed to get more than 200 signatures and Kelowna Mayor Walter Gray signed it into history. If you’re wondering how to talk like Batman, Sun FM’s panel of experts recommends using a “grizzly-bear-that-got-punched-in-the-throat” voice. I guess if you wanted to do it old-school Adam West-style, just bring a sign that says ‘POW’ or ‘BAM’ to work. I had a fun exchange with them on Twitter with The Daily Courier account. Here’s the Storify because journalists love to Storify! Here’s the brief we ran in the paper.